Who doesn’t love chocolate? Okay, I know there are a few people out there that for reasons beyond my understanding don’t, but I know most of you, like me, love chocolate. Sweet, rich, decadent goodness. Sigh. And I don’t know many people, especially children, that don’t love chocolate chip cookies. I know, right? 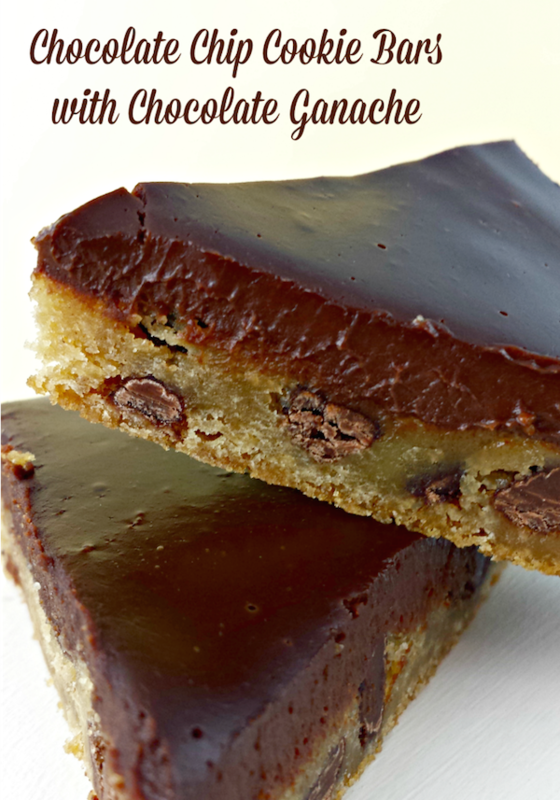 I have this chocolate chip cookie bar recipe with a chocolate ganache topping that makes the ordinary chocolate chip cookie more adult. It’s the chocolate chip cookie all grown up. Grease a 9×9 square baking pan and preheat the oven to 375-degrees. Cream together the butter and sugars in a large mixing bowl. Add the extracts and stir to combine. Sift in the flour, salt and baking soda and mix to combine. Beat in the eggs until the mixture is creamy. Press the cookie dough into the pan evenly. Bake for 18-20 minutes until golden brown. Cool completely. Carefully remove the bars in one large piece from the pan. Place onto a piece of parchment paper. To make the ganache, place the chocolate and cream into the top of a double boiler. Whisk the mixture until the chocolate is melted. The mixture should be smooth and creamy. Cool for 5 minutes before pouring over the cookie bars. Refrigerate for 1 hour before cutting. Store leftovers in the refrigerator in an airtight container. Enjoy! Just the word ‘ganache’ makes it sounds more fancy 😛 Looks delish! Why do I always find such yummy looking recipes when I’m trying to watch my waistline? I’ll have to bookmark it for when I lose my willpower, lol. That looks pretty darned good! Unique too, never tried this before. They look wonderful! I’ll take a few right now. WOWZA! This looks so good! I have never had ganache before and I am for sure I would love it! Wish I had a slice of this right now! 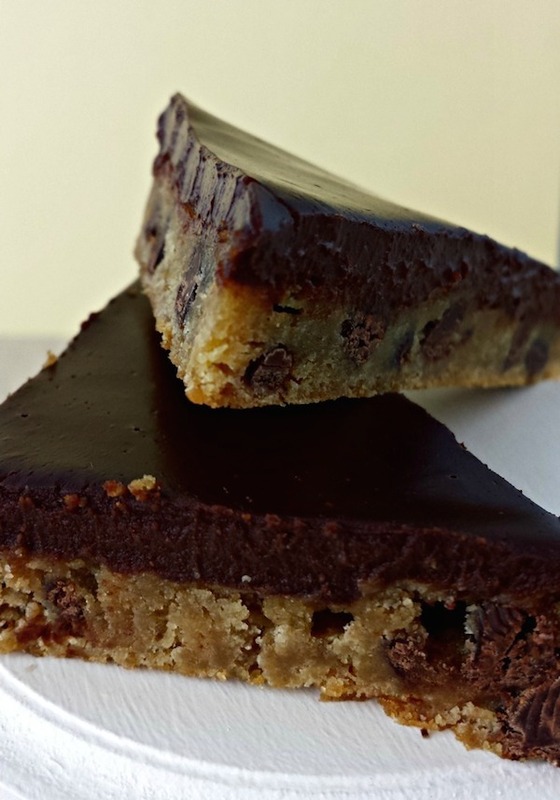 These Chocolate Chip Cookie Bars with Chocolate Ganache Topping look SO delicious! I want some now!!! Okay I want to try those – stat!! This looks and sounds like it should be illegal! I’d have to do a lot of walking to burn off the calories from eating these I’m thinking! These look amazing. I love anything with chocolate! They just looks so decadent… that is a good thing. That looks wickedly scrumptious – yum, yum, yum! Now that’s a great way to add some flair to a traditional cookie. I love this! Those look like I can only eat a little at a time they look very rich. Yum! I love chocolate chip cookie bars because it’s quicker than individual cookies – never thought to give them a topping! Ok, these looks delicious! I could use a few right now. Oh my gosh! This is a scary recipe for me, I think I would be eating them all the time. Mmmm YUM! These look delicious!! Wow these look so yummy. Thank you for sharing with us. That’s a lot of chocolate in one cookie. My daughter would love it.